The flower a tethered butterfly." Marion Jacobs of Laguna Beach, California, informed me that the nine cats on her milkweed plant at home have finished it off in record time. She bought a replacement, transferring the remaining larvae onto the full one. She also donated two milkweed plants for the defunct Alta Laguna Park Butterfly Garden that Anthony, the current city gardener, planted for her. Thank you Marion for the kind and thoughtful gift for the Monarchs. I'm sure those plants will be depleted by voracious Monarch caterpillars before the season's over! I also wish to thank Anthony, or "A.C." for his interest in the butterfly garden. Hopefully, he'll be able to resurrect at least some of it, if the City allows him to. Here's a nice little vid from Annie's Annuals and Perennials on container gardening for those of you who may be interested. Great planting info for just that one pot you want to put on the patio too. The container garden is home to several interesting and hard to find plants that were purchased from her online nursery. All plants arrived healthy, well packed, no worse for wear, and fresh for planting. Annie's physical nursery is located in Richmond, California, close to Oakland in the Bay Area. As I assess their usefulness throughout the season in a butterfly garden (at least this one), I'll be commenting on their relative worth. 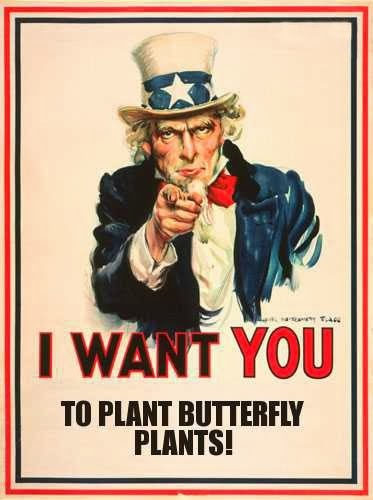 Pretty soon, and if you are lucky, you may find yourself running out of milkweed. Have Monarch caterpillars decimated your milkweed plants and you can't find anymore? What's a parent to do? Feed them pumpkin! This very informative PDF explains the whys and wherefores of getting your cats to a chrysalis stage after running out of milkweed and none is to be found anywhere. As mentioned in the article, other cucurbits such as squashes, cucumbers, and melons could also be substituted. WARNING! This is not meant to be a replacement for milkweed! It only helps get those cats in their last instar to the chrysalis stage. Those at lower instars are most likely to die if not fed milkweed. It's kind of like feeding a 17 year old kid only Twinkies to get them by until they turn 18, after which you can legally kick them out of the house: it's not long enough to outright kill them, but will keep them alive long enough until they can be emancipated.